Andrew Imbrie, while teaching composition and analysis for over half a century at the University of California at Berkeley, has quietly made a place for himself among the greatest of America’s modern composers. Imbrie’s music is instantly identifiable — it has a characteristic ‘sound’ and melodic contour — but is hard to categorize, being neither conservative nor experimental, neither old-fashioned nor fashionably new. He is a profoundly American composer, alive to the rhythmic electricity of jazz and to both the optimism and the uncertainties of the American Century. The Pro Arte Quartet, founded in 1912 in Belgium by Alphonse Onnou (who was succeeded in 1944 by Rudolph Kolisch), continues to maintain an 85 year tradition of dedication to classical and contemporary chamber music. The quartet records and tours internationally, often presenting new works written for the ensemble, while maintaining residency at the University of Wisconsin. 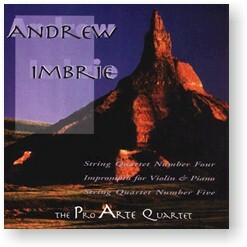 Imbrie’s String Quartet #4 was written in 1969 for Pro Arte, who has performed all five of Imbrie’s string quartets. Written nearly 20 years later (1987), the String Quartet #5 is similar to the fourth, but more elusive in its overall effect. Imbrie wrote his Impromptu (for Violin and Piano) in 1960 on a commission by the Naumberg Foundation. Recorded on May 7-8, 1993 at Mills Concert Hall at the University of Wisconsin-Madison.